How is Germany handling its refugees? Jump to media player Jenny Hill looks at how Germany helps its refugees integrate into its towns and cities. Is the PM leading or following on migrants? Jump to media player Labour MP Jo Cox asks the prime minister whether he thought he had "led public opinion on the refugee crisis or followed it". 'Taliban regime as bad as Syria' Jump to media player Migrants from Afghanistan crossing Europe are increasingly resentful that their needs are taking place to those of Syrian migrants. 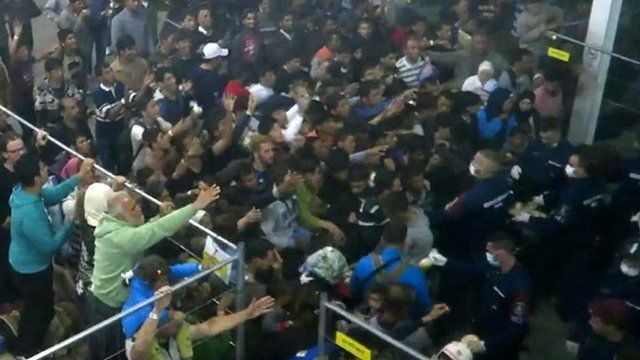 'Orderly queue' to enter Macedonia Jump to media player The flow of migrants trying to reach Europe to escape war zones in the Middle East and poverty and turmoil in Africa shows no signs of easing. Clearing the rubbish at migrant camp Jump to media player At one of the makeshift migrant camps on the Serbia-Hungary border rubbish has been building up, but collectors have now arrived to try and clean up the debris. Video has emerged from the Roszke camp near the Hungary-Serbia border that appears to show hundreds of migrants being fed by guards. Video footage showed chaotic scenes inside the overcrowded camp and migrants are seen pushing and shoving as they try to catch food packs being tossed into the crowd by police. The footage was shot secretly by Michaela Spritzendorfer who was there to bring aid and journalist and activist Klaus Kufner who helped her get access to the camp. This interview was first broadcast on Newsday on BBC World Service radio. You can listen to the full interview here.